Windows Phone 7… Relation to Cloud Computing! In the last Decade we have seen a revolution in the Mobile industry with different operating systems and different manufacturers. The mobile phones are widely spread and each new day it offers something new whether it was an application or an added feature. So as an End-User what suits best my needs? As I am a Cloud Computing freak and the mobile phones target is always to reach the internet and be in touch with all the social networks on the go, I will focus on this point. The storage is becoming very important specially that you are always in need specially that the storage of your mobile are always limited to a certain number of Gigabytes. Imagine you have an online storage linked directly to your Mobile Phone; all you need is a windows live account. Microsoft presents Windows Phone 7. Like I mentioned before I am a cloud computing freak so imagine your online storage is always with you on your mobile (Like SkyDrive). So let me mention more details about its benefits. You work at home using Office 2010 and store your data on SkyDrive an online storage (I mentioned office 2010 because it has a big flexibility to save the data or share it online). On the go or when you are out, you don’t need your laptop to reach for your data or files but you can reach it directly using office on Windows Phone 7. Windows Phone 7 is your portable Gaming Console!! With the Xbox Live on your Windows Phone 7 device you have a variety of games that you can play on the go and communicate with all gamers. So I will no longer talk about WP7 in this part I will just post this article hope you will find it useful as multitasking and cross platform multiplayer gaming incoming! I really find it useful for the delivering the information!! In other way as a summary for this point Windows Phone 7 is becoming compatible with Xbox. For the apps, Windows Phone 7 is not so close nor opens as other companies but has a different point of view. Each day it has a different app ready to be run on it. Actually you create your own and test it on your WP7 phone but to publish it in the market you have to go through a certain procedures. For WP7 interfaces, it has wonderful designs from normal to Panorama designs all you have to do is to thumb right or left. The ease of use is very remarkable and it is like window 7 you do a lot with less complexity and with less clicks. 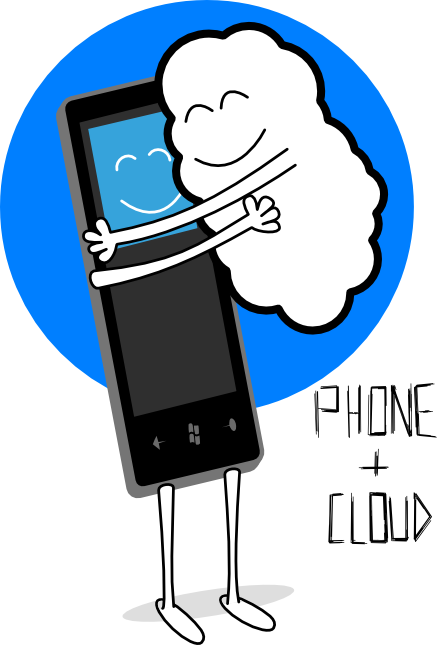 Enough talking about Windows Phone 7 Features let’s get back to the relation between it and the Cloud, as they are in love with each other. WP7 supports different type of Notifications, I will not go through them in this blog but I will try to clear its relations to the cloud. In the other phone you always go to the website or the application on the internet, but did you think the cloud can reach you? Is that possible? Well WP7 make it happens you can reach a WP7, as I am working in a project in Imagine cup I find it very useful and can be widely spread if it is well used.